Make one of these coffee cozies for yourself - and when you see how easy it is - make a bunch more as gifts for all your coffee-loving friends and family members! What a great way to use up the scraps of fabric you have left over from other sewing projects! What I love about some of these coffee cozies is they are reversible — use a different fabric for each side, and it's like you have two separate handmade coffee cozies. 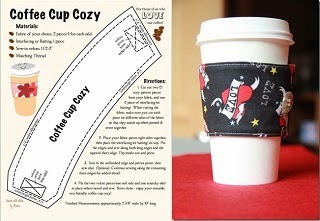 As CraftyStaci said in her blog post: you can't throw a rock, and not hit a tutorial for a coffee cup sleeve out there on the web. Click the links below for your free coffee cozy pattern - choose from reversible, not reversible, buttons, Velcro, skinny, wide, knitted or crochet! • and a whole bunch of coffee cozies crafts I found on on Pinterest!